PIECE IS UTTERLY AND UNIQUELY ENTHRALLING. 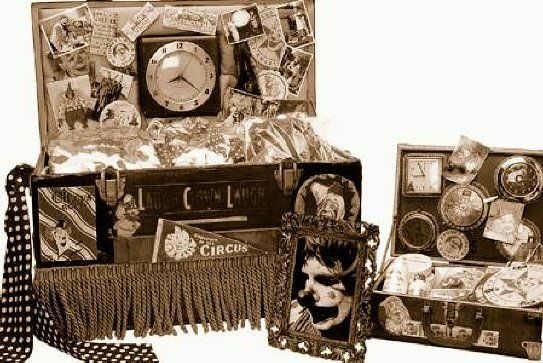 "COME EXPLORE ALL THAT TIME HAS TO TELL"
antique trunks covered with travel stickers containing his make-up kit and paraphernalia. I have a fascination with the circus and performers,"
explains Tat about the theatrical element in his work. Timey serves as my alter ego, a representation of the artist’s long journey for his art." MINDS LIVE (AND SOME LUCKY ADULTS) ....IN THE RICHNESS OF VIVID FANTASY, CUSHIONED BY GRANDMOTHERLY SENSE OF COMFORT. OH WHAT A BETTER PLACE TO BE, THEN TO DISCOVER THE UNEXPECTED, AS YOU LOOK AND PEEK AND EXPLORE INTO THE TIMELESS WORLD OF "TIMEY THE CLOWN." AS BITS AND PIECES OF HIS WORLD ARE REVEALED. SSSHHH, YOU MAY JUST FIND SOME REALLY AWESOME SECRETS. TIME WILL TELL !!! has carved out a career as one of the industry's most versatile executives. Married with two kids, Randy continues to utilize his vast industry contacts and knowledge, while creating successful film and TV productions, a cutting edge artworks collection and has a charming ease, that is rare in our competitive world today. He may just be the undiscovered Superdad!!! Beginning April 30, all exhibited clocks from the individual artists, humanitarians and social activists will be for sale, with 100% of the proceeds benefiting youTHink, an innovative art and education program serving public school students throughout California. The Zimmer Children Museum’s 2004 exhibit, “show&tell,” featured more than 180 works turning the telephone into art, with pieces from celebrities Alicia Keys, Dan Aykroyd, Elizabeth Taylor, Felicity Huffman, Fran Drescher, Frankie Muniz, George Lopez, Jane Kaczmarek, Jason Schwartzman, Mischa Barton, Paula Abdul, William H. Macy and Zooey Deschanel.